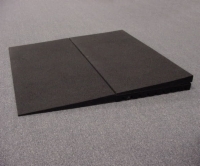 Rubber Threshold Risers are square pieces of 100% recycled rubber that are made to be placed under EZ-Access Rubber Threshold Ramps to provide extra height. One set of risers is required for each ramp that needs to be raised. Risers can be easily trimmed with a jigsaw for a custom fit.